The eastern part of India has five states namely the West Bengal, Orissa, Bihar, Sikkim and the newly formed state of Jharkhand. The cultures and traditions of these four states have intermingled although Orissa has traces of Andhra and Sikkim of Nepal. The vast Bay of Bengal lies on the eastern coast and the impeccable Himalayas in the north. The eastern side of India is full of surprises and abundant with beauty. The state of West Bengal which was earlier a big state of Bengal has been split into two after the Independence of India, in 1947. Adorned with Nobel Laureates like Rabindranath Tagore and Mother Teresa, West Bengal, has some or the other festival going throughout the year. People are seen buying sweets and flowers for the festivity. The culturally forward Bengalis, primarily, are the worshippers of Shakti, Goddess Parvati in all her forms. Late February the festival dedicated to the Goddess of learning, Saraswati Puja or Vasant Panchami is celebrated. Students, teachers and artists worship the Goddess of learning and music. As the time is advent of spring, the day is also known as Vasant Panchami. People wear bright yellow and orange colour clothes to welcome the season. A huge celebration takes place in Shantiniketan during this time. Dances and songs are performed and wishes are exchanged. The Dol Purnima popularly known as Holi all around India is celebrated with equal fervor. The New Year of the Bengalis, Noboborsho, falls around mid –April. Bengali delicacies are cooked and people wearing new clothes wish and gift each other. 17th September is the Vishwakarma Puja, God of creation. People working with tools and machines worship their machinery and tools. Businessmen also keep the shops closed to worship the Vishwakarma. The next festival is the biggest of all the festivals of West Bengal and celebrated with great enthusiasm in October is, Durga Puja. When the whole country celebrates Navaratri, the last four days are celebrated in West Bengal as Durga Puja. Beautiful Clay models of the Goddess killing the demon Mahishasura are made and installed in huge pandals. Durga’s four children Ganesh, Kartikeya, Lakshmi and Sarawati are installed beside her. For all the four days the Goddess is worshipped with all the rituals. Legend says that Mahishasura, the demon received a boon form Brahma of immortality. No one but a woman could kill him. The Gods then created Durga bestowing upon her their divine powers; she ultimately killed the demon and saved the land. The four days celebrated in West Bengal are the days of the war between the Goddess and the demon, in which ultimately good triumphs over evil. The pandals are greatly decorated and people throng to see the decoration in the night. Cultural programmes are organized and the festive spirit continues till the immersion of the idols. It is the season for gifts. New clothes are purchased. Shops overflow with the latest goods. The Grand finale is on the last day, which is called as the Bijoya Dashami. The married women give a tearful send off to the Goddess by smearing sindoor on her. Huge processions with bands of dhakis are taken out and the idols are immersed. Five days after, on the full moon night comes the Lakshmi Puja. Idols of Lakshmi are installed and worshipped for a day. Offerings mainly of fruits and sweets are made to the Goddess. 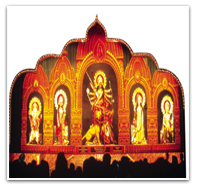 Within fifteen days of Durga Puja comes Diwali celebrated all over India and known as Kali Puja in West Bengal. Once again idols of Goddess Kali are made and installed and worshipped. People enjoy eating goodies and burning crackers.The Christians and the Anglo Indians of Calcutta, celebrate Christmas and New Year, with great frevour. Another prominent state in the eastern part of India is Orissa. Famous for its ancient connections with the Maurya dynasty, Kalinga as it was known then is today known as pilgrim of the east. The major eastern festivals of Durga and Kali Puja along with other common festivals are celebrated here. Magha Sapatami is the most popular and colourful festival of the temple city of Konark. This is an occasion for a grand congregating of Indian pilgrims who take holy dips in the Chandrabhaga Tirtha near the sea and welcome the rising Sun with prayers. This festival falls around end of February. Jaggannath Puri is one of the four sacred pilgrimages of India. The Rath Yatra that takes place here every June –July is the most famous religious occasion. The three deities Lord Jaggannath, Balbhadra, his brother and Subhadra, his sister are taken in a chariot procession to their summer temple for a week. Prior to this, the three deities have a ritual boat ride after a refreshing bath in fragrant sandalwood scented water. This is followed by Snana Yatra, literally the festival of bathing in which the main images are bathed ceremoniously. The deities then retire to their garden home and after eight days, they return to the main temple riding their magnificent chariots, drawn by devotees. Hundreds of thousands gather from all over the country to witness this festival. New chariots are made each year. During the festival Puri turns into a sea of People. The idols made of wood are buried in the temple complex and new ones are made every twelve years. All can participate in this festival and actually touch the deity to take the blessings. Jharkhand, the newly formed state was earlier part of the bigger state of Bihar. Primarily inhabited by tribes, this state is rich in Mines and Minerals, Industries, Wildlife Sanctuaries and Forests. Sarhul is the most famous festival among the tribes. Chaul is another festival celebrated. The ancient state of Bihar was the main ruling point of the ancient dynasties of India. Places like the Pataliputra, now Patna and Nalanda have been mentioned in the epics and ancient scriptures. One of the most prominent sites of the Buddhist pilgrimage, Bodhgaya, rests in Bihar. Huge celebrations take place in Bodhgaya during Buddha Purnima. The Buddhists believe that Lord Buddha was born, attained enlightenment and also attained nirvana on the same day. Buddhist rituals for celebrating the three-in-one occasion are naturally elaborate. The day falls in the month of May. Bihar is also the birth place of the 24th tirthankar who preached the Jain religion, Lord Mahavir. Mahavir Jayanti is the most pious occasion for the Jain community. On this auspicious day grand chariot procession with the image of Mahavir are taken out, rich ceremonies are held in the temples, fasts and charities are observed, Jain scriptures are read, and at some places grand fairs are set up. Other Hindu festivals are celebrated with equal vigour and pomp and show. The most famous festivals of all is the Chhath. Chhath falls on the sixth day in the month of Kartik, which is around November just after Diwali. The festival is dedicated to Sun God. Women keep fast and worship the Sun God during sun rise and sun set. The prayers are primarily for the well being of their children. They also take out a procession to honor the Sun God offer Fresh paddy, sweets & fruits. Chhath is a very joyous and colorful festival. The small state of Sikkim on the foothills of the Himalayas is a beautiful unexplored religious state. Majority of the population here is Buddhist and although Hindu population is also present. Festivity all over India means songs and dance along with gifts and delicacies. But Sikkim’s dances are extraordinary and very much different from rest of India. The Losoong or the Sonam Losar is celebrated as the New Year around February. People rejoice and celebrate their harvest. Youth all over Sikkim have archery competitions and lama dances are held in some of the important monasteries two days prior to Losoong. These dances symbolically exorcize the evil spirits of the past year and welcome the good spirits of the coming year. Pang Lhabsol, celebrated in August is a unique Sikkim festival. The people of Sikkim worship and pray their guardian deity, the mountain of Khangchendzonga. Lamas portray the deity with fiery-red facemasks with a crown of five skulls, riding a snow lion. 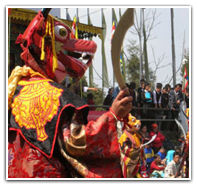 Tashiding Bumchu is another typically Sikkim festival. The Bumchu is a sacred vessel whose water level foretells the luck of the year ahead. It occurs around January – February and continuous for three days when devotees from different parts of Himalayas come for blessings and celebrations at Tashiding monastery.